An 11 to 1 Delivery System that designed to simplify the application process. No need for specimen cups, the PRP & activator are loaded into the QuickDRAW directly from the syringe, improving sterility and handling. Increased power and lighter buckets lead to improved separation in shorter time periods. Aerosol bucket caps adds additional safety and improved braking technology maintains optimal separation in significantly shorter braking times when compared to the Elite Series Centrifuge. Tabletop device holder. Hold up to 4 concentrating devices. 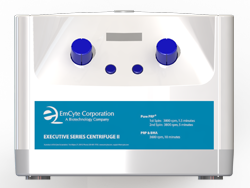 New Platinum Series Centrifuge is now automated with pre-programmed protocols that allow users to simply push a button to begin processing. This new and innovative technology improves the point of care experience.